Altogether fourteen people attended the mini-reunion at The Three Ways Hotel in Mickleton on Sunday and Monday 20/21 October 2013. Dave Rodgers and Judy were the first to arrive just before lunch and Tony and Pam Beard and Tony and Judith Mooney arrived soon after. All six went off to a local pub for roast pork sandwiches and when they returned they unloaded Tony’s car and set up the display in the Terrace Room. Others soon arrived and joined them and in no time at all the room was afloat with nostalgia. During the afternoon Stan Folds presented an 84th Entry car badge to the archives and is was immediately placed on display. David Rodgers donated a CD of the profile booklet given out at the 50th Anniversary Reunion. By the end of the afternoon everyone had arrived except Harvey and Joy Morton who were not due until the next day. It was a terrific meal and the service was excellent. Pam Beard stood to thank her husband for organising the reunion. There was much talk of Locking and our service days afterwards as well as talk about retirement and our present lives. The gathering broke up at bedtime. There was no programme planned for the next day so people chose their own amusement after breakfast. Most had lunch together in the hotel courtesy of Nobby who had done well out of the recent sale of shares in Royal Mail. After lunch many adjourned to the Terrace Room to while away the afternoon with memories and yarns about out three years together at Locking. Harvey and Joy arrived to find us all wallowing in nostalgia. Harvey brought with him to present to the archives, an attendance list he made when he was organising the Easter Dance in 1959. We gathered for dinner at 7.30 p.m. And again had a terrific meal the highlight of which was the parade of the Four Puddings chosen especially for us by the staff from the extensive Pudding Club menu. 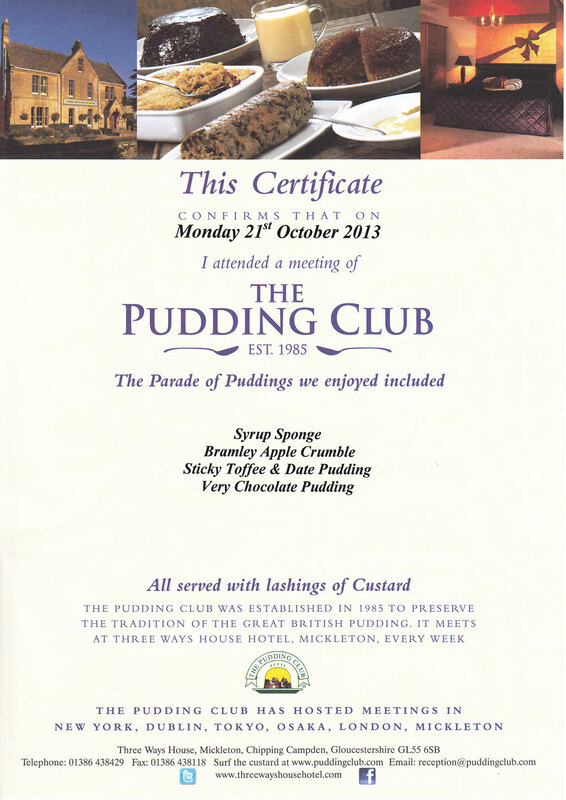 After we had finished eating we were each presented with a certificate to commemorate our visit to the Pudding Club. we were entertained by Nobby who sang a fishing tale to us and by Harvey who told an amusing tale which had us all in stitches. Again we finished late and only when bedtime was long passed. After breakfast the next morning we began to pay our bills and say our goodbyes. Everyone was pleased they had come and there was much talk of our time together and when we would meet again.